As Julie Smoragiewicz walks up the short hill behind her home in the beautiful Black Hills, she shakes her bucket of treats. The large pellets of compressed alfalfa make a familiar noise, and her furry pets come running toward the fence line to greet her for their special snack. These are no average pets. These are large, woolly, horned, and unique; so unique, that they are the only ones of their kind in the area. Julie is feeding her yaks, the animals that gave her and her husband Jim’s farmstead, Yak Ridge, its name. Although more known for calling the Himalayan Mountains of Tibet home, this small herd lives just a few miles outside of Rapid City. Though neither Jim nor Julie was raised on a farm or ranch, all four of Julie’s great-great grandparents homesteaded on the other side of South Dakota, and Jim’s father was a young, farm boy in Poland before moving to the United States. All of these familial influences worked into the formation of Yak Ridge. Attempting to connect to the land and be more self-sufficient were important to the Smoragiewiczs, especially after the death of Jim’s dad. They felt this little bit of land helped honor him and his Polish ancestry. The idea may seem very unusual, but raising yaks made perfect sense to Julie and Jim. When planning their farmstead, the two did much research to decide what livestock to raise. They looked into sheep, goats, and cows. However, the benefits of raising yaks kept outweighing what they learned about other possibilities. Yaks are very self-sufficient while being easy on the environment. For their size, they eat less food than other herds and produce less waste, as well. Because of this, pound-for-pound, they take less of a toll on their surroundings and their owners’ pocketbooks. Keep in mind where these animals originated, and it is clear that they can be left alone for longer periods of time, even in the winter. Yaks will break through ice to find water if they have a source nearby and will even eat snow instead of drinking water. They will also dig through snow, much like buffalo, to scavenge for food underneath. Yaks give birth to smaller young, making it easier for caregivers and healthier for both yak momma and yak baby. They are also very, very friendly animals. Yak young are incredibly playful, and when raised with regular interaction with humans, trust is developed with the caregivers—much like Julie and her social, furry friends. The yaks at Yak Ridge. The benefits Julie and Jim learned aren’t just about caring for their animals, yet that is a major plus. Yaks produce many products. Yes, they have tasty, lean, red meat that can be cooked just like beef, but there are also other uses for yak goods. The milk is high in fat, making wonderful cheeses, butters, and yogurts. The wool can be harvested from trimming the long yak skirts or combing the thick under-layer of yak fur. They can even use their own fitness to be pack animals—remember yaks were originally used for this in the cold, Himalayan Mountains—and can carry up to 300 pounds of cargo. If all of these reasons weren’t enough, the glorious hillside just opposite the newly-built Smoragiewicz home is in the shape of a yak’s back, the buffalo-like hump of the shoulders clearly visible through the trees. Yes, Yak Ridge was meant to be. However, it isn’t just a place to pet a friendly yak or source some wonderfully-lean meat. Yak Ridge is so much more. 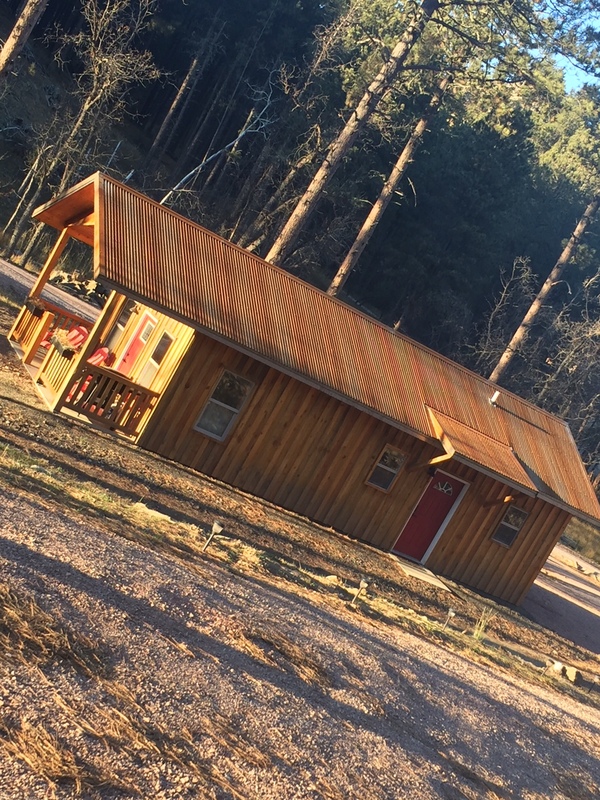 Jim and Julie also built three guest cabins in addition to their home, garage, and barn. 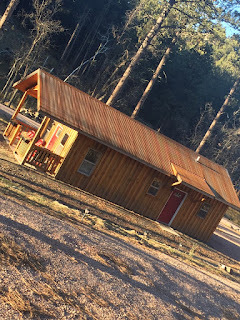 These cabins—which were first rented out to the public this fall—sleep 4-6 people, with private kitchens, baths, and porches for Black Hills travelers to enjoy. In the summer and fall, the front porch flower boxes are actually not filled with flowers but with tomato and herb plants for use in the modern kitchens. Books about yaks in the cute, comfy, and modern cabins. There are plans for two more cottages in the future, but it is important for Julie—former owner and chef of Dakota Thyme in Rapid City—to keep the operation small enough for the two of them to manage and maintain all aspects of the business on their own, while still having some semblance of a life Jim and Julie can enjoy. Other small expansion plans are in the works, but most of these plans are Mother Nature’s doings, not necessarily Julie’s. For instance, over 40 baby chickens are currently growing in Julie’s new barn. They should be laying eggs by the spring. The bees living in Yak Ridge’s hives produced an abundance of honey this fall, and signs are good that will continue for next year as well. A slight expansion is planned for the yak herd…actually quite soon. One of Julie’s cows will be giving birth to the newest addition of the Smoragiewicz herd next month! Yak Ridge will soon have a baby in its midst. As Julie gives one more treat to Houdini—her steer that is soon headed for the greener pastures of yak heaven—she ruffles the fur on another yak nudging its way toward the treat bucket. The friendly livestock has surely made the past construction-filled year at Yak Ridge worth every moment. She has gotten to know more about these majestic creatures, all while creating an inviting place for tourists to stay. Yak Ridge is definitely in style as it helps Jim and Julie live the lifestyle they desire.